The story initially came about when I merged the Knights Templar referenced in The Da Vinci Code with the male archetypes examined in Brokeback Mountain. While working on the story, I began developing an idea for another novel involving controversial ancient artifacts being unearthed in modern-day Jerusalem. I thought it might be interesting to combine the two stories and move between ancient, medieval and modern-day timeframes. The resulting novel was an unwieldy 169k words, and so I divided it into two novels, the other one being a sequel to this one titled The Talpiot Find, eventually following that up with a sequel titled Ontogenesis. I queried The Talpiot Find for about a year but kept getting “Not for me” responses from literary agents. Querying Secreta Corporis was equally unsuccessful, and so I decided to self-publish both. I believe the controversial aspect of the ancient artifacts made the books untouchable for the agents. While reading the book The Bible Unearthed by Israel Finkelstein, I encountered for the first time the theory that the book, or scroll, mentioned in II Kings 22:8-13, which was found during Temple repairs, may actually have been a forged document created by the priests and scribes but was presented to the people as the writings of Moses from six centuries earlier. The artifacts I created in the novels represent the rough draft of this scroll on clay tablets that had somehow ended up at the potter’s rather than being returned, unfired, to the clay pile. When the fired tablets were discovered by the scribes, they were immediately discarded in a trash pit, but one tablet was found by a Templar in the 12th century, and that tablet led to the finding of the rest of the tablets in the 21st century. The implications of Finkelstein’s forgery theory are profound: if New Testament writers weren’t aware that the compilation of the Torah had begun with a forged document, serious doubt is cast on their claims of inspiration, which in turn casts doubt on any of the modern religions which hold the writings of Moses and the Apostles to be God-given. Why would I choose such an unpopular topic for my novels? Modern-day Israel bases its claim to the land on covenants God made with Abraham and Moses giving the land to the Jewish people in perpetuity. To reclaim the land in the 20th century, Israelis forced Palestinians out of their homes and illegally assumed ownership of those properties. Entire towns were evacuated and taken over by Israelis. The anger in the Muslim world caused by the unwavering support of the US for Israel’s claim to the land finally erupted on 9/11 and, to date, everyone in the West remains at risk for an inattentive TSA agent allowing someone to smuggle explosives onto a plane. If it came to be known that the covenants with Abraham and Moses very likely had been fabricated by the priests and scribes themselves during the reign of King Josiah, Israel could no longer claim ownership of the land in perpetuity. Israelis currently claim a “birthright” to the land, but their possession of the land came to an end in AD 136 with the Bar Kokhba revolt and 18 centuries have passed with the land not being an independent nation governed by the Jewish people. Any statute of limitations will have run after 18 centuries. With the final ousting of the Crusaders from the Holy Land at the Battle of La Forbie in 1244, the land came under Muslim control for the 7 centuries prior to Israel’s declaration of independence in 1948. Because the land had been under Muslim control for those 7 centuries, and not under Jewish control for 18 centuries, the “birthright” to the land actually belongs to the Palestinians. If that were understood and accepted by people in the US, the threat of violence perpetrated by radical Muslims would be reduced. If Israel were forced to pay for the properties they have forcibly taken since 1948, the conflict in the Middle East could be resolved. You can see that what the author attempted to do deserves more than just a perfunctory “Nope. Sorry.” In addition to informing the reader of the dangers faced by gay people in past centuries, I wanted to help make things better by examining the current Mideast conflict, from the perspective of three widely spaced points in time, to try to find some way to untangle it. But the way I’ve found, recognizing that the recovered scroll was very likely a forgery, is distasteful to many readers and literary agents. Still, when one realizes that, after the finding of the scroll, the authority of the priests increased so much that the king was then required to seek their approval, one has to acknowledge that Finkelstein’s forgery theory sounds very plausible. The five novels I’ve self-published can be seen at https://www.amazon.com/default/e/B002ES921O. (The sixth book, Life Doesn’t Always, is an early version of Tinselfish and is out of print but Amazon’s policy is to continue displaying out-of-print books.) More information about Secreta Corporis and The Talpiot Find can be found on web pages I created for them at http://www.carpecranium.com/secreta/ and http://www.carpecranium.com/thetalpiotfind/. I’m currently working on a sixth novel which examines the political polarity in the US, using the metaphor of theme-park design; I’ve recently begun chapter 14. All things considered, am I the type of gay author that Lambda Literary wants to tell “Sorry. We don’t review self-published books”? With the scope of my writing and with my style of writing, which can be further examined in the online book samples, aren’t I actually an author who should be allowed into the club of gay authors whom Lambda Literary recognizes? I know there are standard channels for access to that club, but at 62 my number of hoop-jumping years is starting to become limited. I feel that the extent of the research I’ve conducted for each of my novels, the endless editing and proofreading I’ve performed on them, and the volume of information about the art of writing I’ve gleaned from reading authors like John Updike and Umberto Eco, all qualify Secreta Corporis for your consideration. 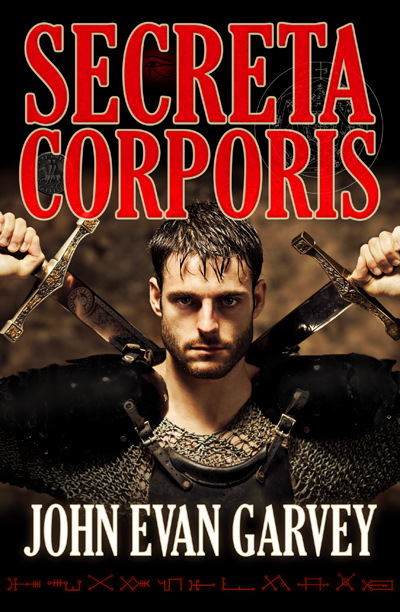 Secreta Corporis is, in the tradition of The Name of the Rose, a marvelously erudite novel that brings the past to life in all its complexity while engaging the reader’s sympathy in the love story of Rolant and Audric, Knights Templar, as they travel in and around the Holy Land at the end of the 12th century. Garvey’s book immerses the reader in Rolant and Audric’s world while never losing sight of the deep bond between them that is the heart of the story. This is not the cartoon version of the past readers get in so many historical novels but a rich and detailed landscape in which the reader can happily lose him- or herself. I highly recommend it. Please consider including a review of Secreta Corporis in the Lambda Literary Review.